As camera technology improves, just about any kind of shot is possible: aerial, underwater or tracking from the air with a drone. George Willis, a South African DOP now based in Canada, recently shared the pic above on Facebook. Each camera mount was made of steel with a sprung base. On the lower front right there’s an Arri IIC with a 9,8mm Kinoptic lens; the rearward facing camera is also an Arri IIC, with an 18mm Cooke Series II lens, operated by a high-speed control behind the petrol-tank-mounted Arri BL1, similarly equipped with an 18mm Cooke Series II lens. Tink Minster designed and made the “vibration sandwich” below the side-mounted camera. The design was so successful that it was copied and is still used around the world. The rig was made to shoot a 1978 documentary about motorcycle gangs, and also to shoot racing scenes for a feature film called The Fifth Season, written by Emil Nofal and directed by Gordon Vorster. 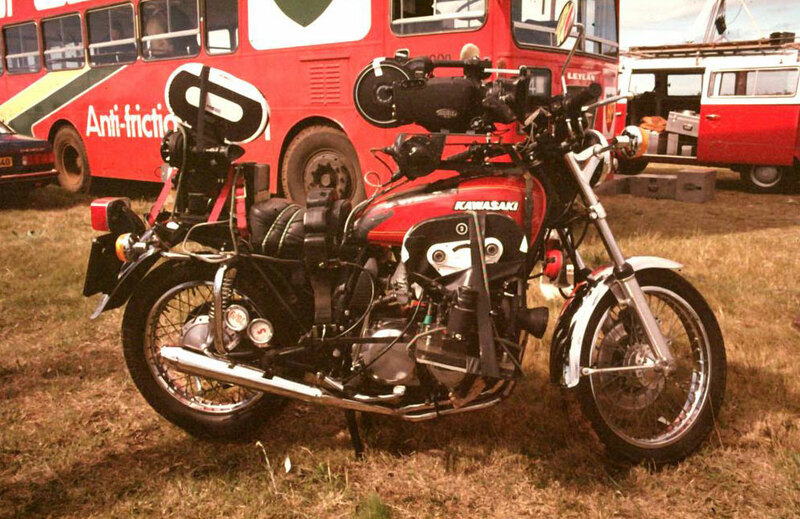 “I had to remember to turn the cameras on and off,” says Willis, who rode the Kawasaki 650 (pictured above) for the documentary. This was important because he was limited to a run time of less than three minutes before a reload!